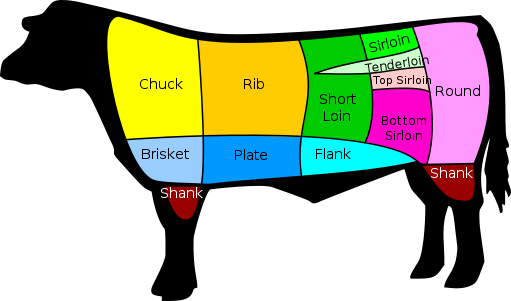 Because many Missouri Grass Fed Beef customers like to visualize the various beef cuts, we've created this guide. Download the Beef Cuts Chart to see the images of the different cuts of meat and the recommended cooking methods for each. If you are a first-time customer, be sure to visit our First-Time Customer Center. If you are ordering a half (a side) or whole beef, you have various options on how you want each section of the beef cut: roasts, steaks, stew or kabob meat, ground, etc. This gives you the ability to choose the options that best suit your needs. Also, steaks can be cut to various thicknesses (we provide recommendations) and packaged a certain number per package, which you specify to suit your needs. For a half beef, there will be approximately 30 lbs of ground beef without adding any additional from the cuts below, and 60 lbs for a whole beef. While we've given the half-a-beef weight for each section, just double the totals if you are ordering a whole beef.